Rotary File for May 16, 2017 | Rotary Club of Iowa City A.M.
Kara Logsden and Shauna Riggins, Iowa City Public Library, discussed the new ICPL Bookmobile service and provided a tour of the vehicle. Mini-golf tournament will be our next fundraiser at Colonial Lanes at 5 pm on June 5. This event will take the place of our normal Month Opener. A sign up is going around. The cost is $10 per person plus bring cash for bets on individual holes. Mike Messier said those who have volunteered to assist at the Johnson County Community Foundation Golf Tournament on May 22 will be sent a reminder with their duty and arrival time indicated. The Board meets on May 18. The Antelope Lending Library is holding a White Antelope Rummage Sale at 1122 5th Ave. in Iowa City on Sat., May 27 from 9-2, Sunday, 5/28 from 1-4 and Monday, 5/29 from 9-noon. Wanted (between May 15-26) are picture books, kid's chapter books, YA fiction, adult fiction and non-fiction, clothes, games, DVDs, household items and more. Proceeds will go to support the Antelope Lending Library. See Cassi Elton for questions and contributions. Kara Logsden introduced the ICPL Bookmobile Assistant, Shauna Riggins. 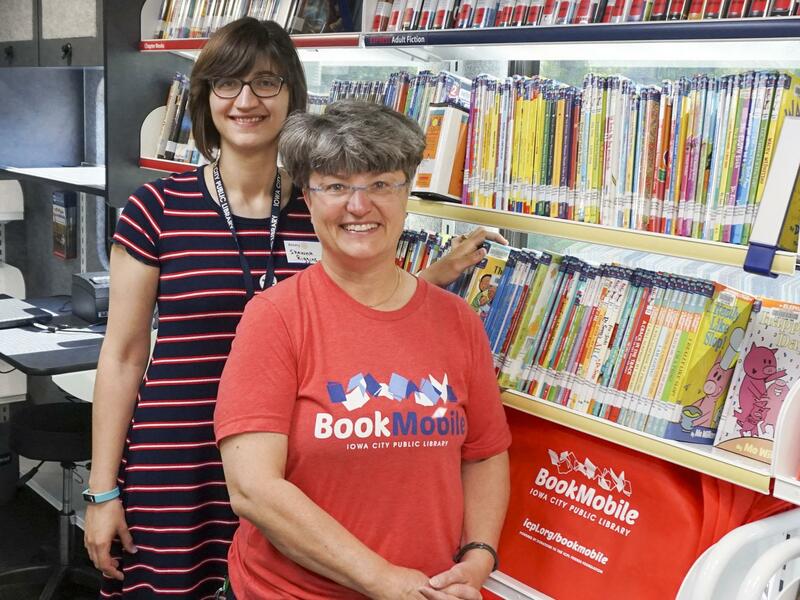 The Bookmobile starts service June 1. Copies of the schedule were made available at each table. The bookmobile was identified in the last 5 year strategic plan as the most cost-effective means of growing library services at this time. The bookmobile will particularly address the need for ICPL to get out into the community more with its services. It will concentrate services at schools, retirement centers and locations close to the neighborhood centers. Schedules will be analyzed and revised about every 4 months. Any individual can call to have materials placed on hold and brought out to a specific stop to be picked up. The services are seen as complimentary rather than in competition with the Antelope Lending Library and the staff of these two services have worked together to enhance cooperation. Antelope primarily provides services to children in the summer months while the ICPL Bookmobile will be available year-round and will divide service about 60-40 between children and adults. The new Bookmobile was parked in the Kirkwood parking lot so that we could check it out after the meeting. It is stocked with a variety of popular materials, children's books, audio-visual materials, and computer access.